In connection with this month’s article on real and false faith, I reread this 1919 classic by Chafer. As with Machen’s book last month, if you didn’t know it, you would think this was written in the 90’s. 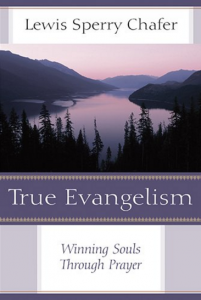 I knew that Chafer questioned early evangelistic methods in this book and in it spoke against false professions and evangelists who produce them. As with Strong, Buswell and others, Chafer was a theologian who applied his doctrine to his ministry of evangelism. If men like these saw gross misuse of the gospel of grace in their day, think of what they would see today! May God raise up more like them in our day whose Bible and lost souls are more precious to them than the praise of men.